Use the map below to find the firehouse closest to you. You can also use the My Milwaukee Home program to enter your address and locate the firehouse nearest to your address. Station 1 is located in the First Battalion. This station houses Engine 1 and Tactical EMS. Station 2 is located in the First Battalion. This station houses Engine 2, Ladder 2, the Dive and Boat Teams, Firefighting Deputy Chief, the Incident Safety Officer and the Fire Investigation Unit. Located above Station 2 is the MFD Bureau of Administration. Station 4 is located in the Seventh Battalion. 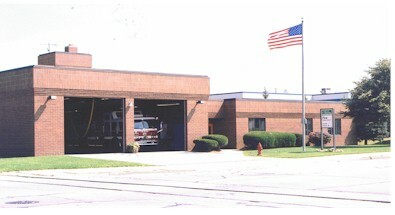 This station houses Engine 4, Ladder 3 and Community Paramedics. Station 6 houses Community Relations. Station 7 is located in the Fourth Battalion. This station houses Engine 7 and Battalion Chief 4. Station 8 is Located in the Seventh Battalion. This station houses Engine 8 and MED 16. Station 9 is located in the Seventh Battalion. This station houses Engine 9 and MED 4. 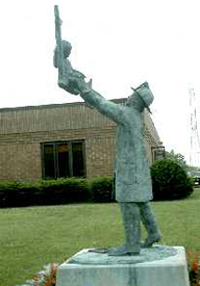 In front of Station 9 (above) is a statue of a firefighter reaching up to save a little girl from the window of a burning building. Station 10 is located in the Third Battalion. This station houses Engine 10 and Battalion Chief 3. Station 11 is located in the Fourth Battalion. This station houses Engine 11 and MED 15. Station 12 is located in the Fourth Battalion. This station houses Engine 12, Ladder 1 and the Incident Command Post. Station 13 is located in the Second Battalion. This station houses Engine 13. Station 14 is located in the Fourth Battalion. This station houses Engine 14 and Ladder 8. 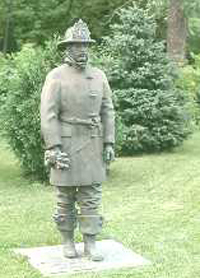 Station 16 is located in the Seventh Battalion. This station houses Engine 16 and Battalion Chief 7. Station 17 is located in the Fourth Battalion. This station houses Engine 17 and MED 17. Station 18 is located in the First Battalion. This station houses Engine 18 and Battalion Chief 1. Station 21 is located in the First Battalion. This station houses Engine 21 and MED 6. Station 22 is located in the Second Battalion. This station houses Engine 22. Station 23 is located in the Fourth Battalion. This station houses Engine 23, Rescue 1 and the Heavy Urban Rescue Team (H.U.R.T.). Station 24 is located in the Second Battalion. This station houses Engine 24, Rescue 2, and the Heavy Urban Rescue Team (H.U.R.T.). Station 26 is located in the Third Battalion. This station houses Engine 26 and MED 3. Station 27 is located in the First Battalion. This station houses Engine 27 and Ladder 5. Station 29 is located in the Third Battalion. This station houses Engine 29 and MED 18. Station 29 is home for the above modern artwork titled "Deflected Jets" by Guido Brink. It depicts silver jets of water. Station 30 is located in the First Battalion. This station houses Engine 30 and MED 7. Station 32 is located in the Third Battalion. This station houses Engine 32 and Ladder 9. Above is a close up of the mural that is painted along the side of Station 32. Station 33 is located in the Third Battalion. This station houses Engine 33, Ladder 16 and the Hazardous Materials Team (H.A.Z.M.A.T.). Station 34 is located in the Second Battalion. This station houses Engine 34 and MED 13. Station 35 is located in the Third Battlion. This station houses Engine 35 and MED 14. Station 36 is located in the Second Battalion. This station houses Engine 36 and MED 5. Station 37 is located in the Second Battalion. This station houses Engine 37. 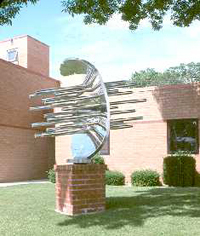 Titled "Engine 37," this piece is by artist Mark Jeffries and stands to the side of the firehouse. Station 38 is located in the Seventh Battalion. This station houses Engine 38 and MED 19. Station 39 is located in the Seventh Battalion. This station houses Engine 39 and Ladder 7.